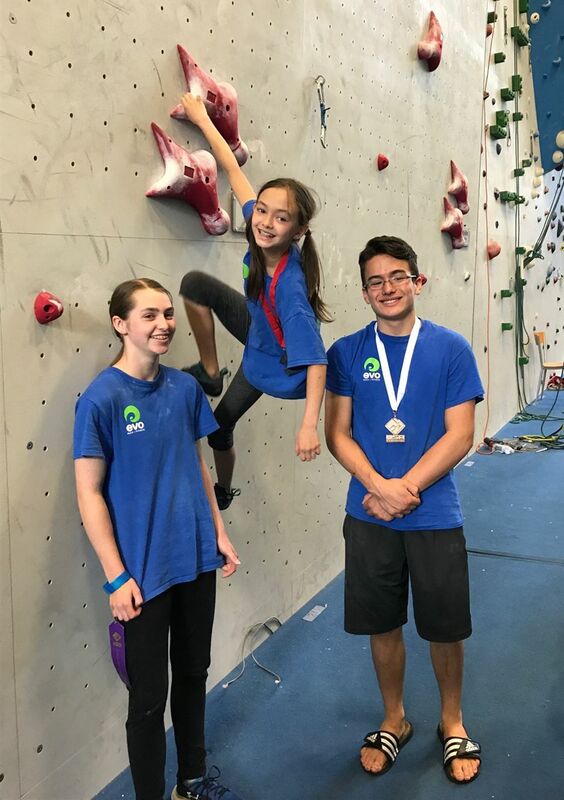 On July 13th-16th, three of EVO Rock + Fitness’s Portland Team kids will be heading to the USA Climbing: Sport & Speed Youth National Championships in Kennesaw, Georgia. Even with all their busy training schedules, Kaitlyn, Anabelle, and Max were able to sit down and talk about how they got started climbing, why they got into speed climbing and what their future climbing goals are. So, what age did you start climbing? Kaitlyn, age 14: I started climbing when I was 7 years old. Max, age 12: I started a year ago when I was 11. Anabelle, age 10: I started climbing everything at age 2. What got you started climbing? Kaitlyn: I went to a birthday party at the old Maine Rock Gym and it was fun. My dad was also a climber and that’s how I started going to the gym. At first it was once a week for about an hour or so, but then three years ago I decided to join Team at EVO Rock + Fitness. Max: I had gone to a couple climbing birthday parties and climbed at a summer camp and I really enjoyed it. I decided to join Club at EVO Rock + Fitness and was invited to join Team. I really like the workout and the community that I get to climb with. Anabelle: I was just climbing everything. I was climbing furniture, doorways, and the playground, I even had an adult call 911 because they thought I was climbing too high. Before EVO Rock + Fitness opened, my parents bought me a gift certificate to start climbing here. Kaitlyn: It’s my passion! It’s such a great community and it’s really fun. Max: I really like the workout and it’s an activity that I can do year-round. I always end up getting an amazing workout in. I just don’t think you can get that in many other sports. Anabelle: When I climb, there’s this feeling in my heart that I can keep going. I feel like I live in whole different world when I’m climbing. What drew you to start competing in Speed Climbing? Kaitlyn: I just thought it looked really cool, I don’t like leading as much and I wanted an alternative. Max: Well, I really like sprinting and the speed of skiing. I think it’s the rush of energy that I enjoy when I am going fast. When I am speed climbing, it’s one moment. I block out everything and put my all into this one moment. 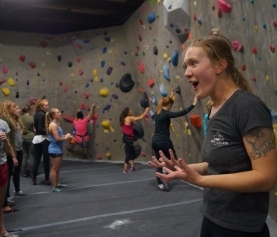 Anabelle: I have competed before, but speed climbing started when I was going to regionals, my mom asked me if I wanted to try and at first I said no but then I changed my mind and decided to give it a try. I ended up placing in the top 2 for both rounds. After that I just decided to keep competing for speed. 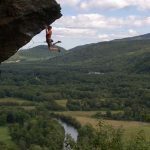 What is the most difficult part in the speed climbing route for you? Kaitlyn: The hardest part is placing your feet exactly where they need to go. It’s difficult because sometimes you can’t look at your feet. I think the most challenging part of the route is the beginning section, even though it’s the easiest part, I seem to forget and mess up. Max: Getting all the moves right is difficult. It’s too often that I grab something and I swing out, or I don’t get to where I want to be. The goal of Speed Climbing is to go as fast as you can which makes being precise difficult. I find the middle part to be the most difficult for me because I can’t reach the best parts of the holds. Anabelle: There are good holds to grab but there aren’t a lot of feet. I have to plan on the ground and make sure that I have foot hold. For me, because I am short, I can’t just reach, so I have to jump with all my might. 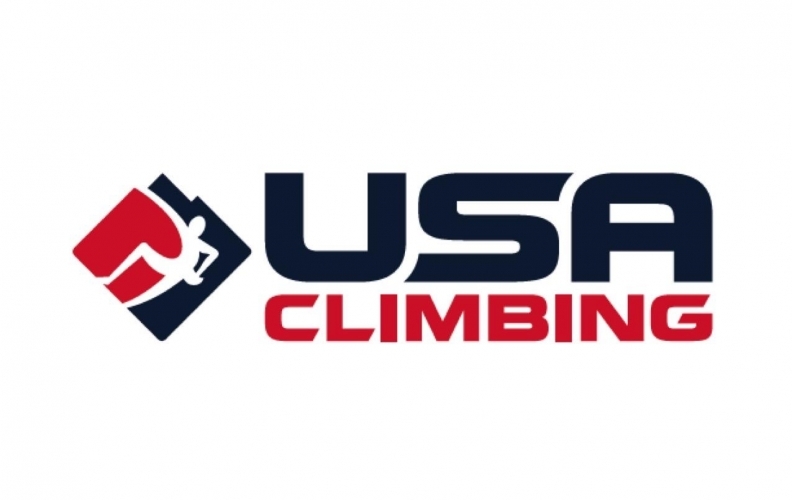 After this competition finishes, what are going to be your personal climbing goals? Kaitlyn: I want to continue to improve and work hard. I also want to get outdoors and climb more. I’m going Joshua Tree in April with my family and I’m really excited about that. Max: To keep doing climbing as much as possible. I know for sure my life will get busier but I don’t want to ever quit, I want to continue to be active in climbing. Anabelle: My goal is to inspire other small and young climbers that they are still strong and it doesn’t matter what other people say to you. I’ve learned that you can’t let other people tell you what to do. Small females can climb strong. Also I want to be able to lead climb soon. Do you have a climbing hero or someone you’re inspired by? 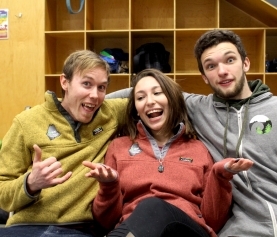 Kaitlyn: My dad inspires me, as well as, Coach Sean and two professional climbers, Chris Sharma and Ashima Shiraishi. It was exciting to see Ashima at Division’s Competition and I got to meet her! Max: I’m not inspired by anyone in particular but to see all the people that come to Evo to workout and climb is great. Anabelle: Since I started climbing, I have known of professional climber Ashima Shiraishi and I really wanted to be like her and just focus on climbing. I think I inspire my brother, he’s 9 years old and he’s a climber as well, He trains hard and places in competitions too. We belay each other and we help my 2 year old sister learn to climb. Aside from climbing, what else do you enjoy doing? Kaitlyn: I like to draw and sing. I also enjoy surfing and doing archery. Max: I participate in Boy scouts, lacrosse, and skiing. I also was in my school’s concert band, jazz band, and chorus. I think I am going to have to cut out a few classes in the spring. Anabelle: I play lacrosse and the violin. I also spend time at my lake house. In order to help me continue to climb, my family is going to set up a boulder area in my house. What’s your favorite part about climbing? Kaitlyn: I just love it, I want everyone to try climbing because it’s awesome. Just recently I got my friend to try climbing and eventually she got invited to join Team. Max: The mental part. When I am lead climbing, I still have a fear of falling. When I am prepared to fall, I have no problem with letting go, but when I feel unprepared, I get nervous. I enjoy that feeling. Anabelle: I just really like having the challenge to compete all the time, I enjoy the thrill of being up high. Well, there you have it. 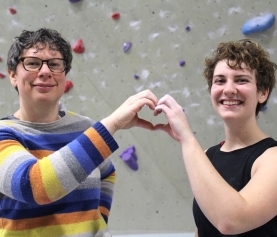 Not only are these local crushers awesome at climbing and have probably already sent your projects, but they are clearly wise beyond their years. EVO Rock + Fitness wishes them good luck in their ongoing endeavors.